Terry's Dad got sick and needing money for gas, I pawned my gold wedding ring, an unfortunate necessity for the family. Dad became almost bedfast at home and required round the clock care, we all were pitching in. My beloved was becoming ill also, so I would come to Dad's house right after work. As a result I didn't get my wedding ring out in time and lost it to the Pawn shop. I have no regrets. I would have gladly done the same again to help Dad. I missed my wedding band and it was the only physical thing that I lost that I think I ever cried over. 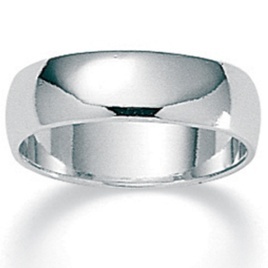 I had the mate to the wedding band, but it wasn't mine, it was my sisters'. I wore it a few times, it didn't feel right, so I gave it to my sister. After the death of my Beloved, I was in so much pain I could not even think of replacing my wedding band or putting another one on, to do so would have been an unimaginable torture, a constant reminder of what I had, and what I had lost. Today, I bought another wedding band, and after 4 years of healing from this pain, I was ready to put it on again. There will always be a part of me that is always going to be Terry's wife...Mrs. Terry Lee Horne, and although he is gone for a time, there is part of me that still needs to be that wife. When he would go out with me, many times because of his illness Terry had to stay in the truck while I shopped or did tasks that needed to be done. For some reason, this seems very familiar now. Terry is outside of where I am waiting for me to complete my task here so that we can journey again together. I'll never forget coming out to the truck to see him sitting there, how happy I was, even if I had just been in the store a few minutes. How much happier will I be when I see him again after the time allotted me? The wedding band I got today is silver... I will await another gold one when I see my beloved and he places the next one on my finger.